Deranged Corprus has +5/+0 on your turn. 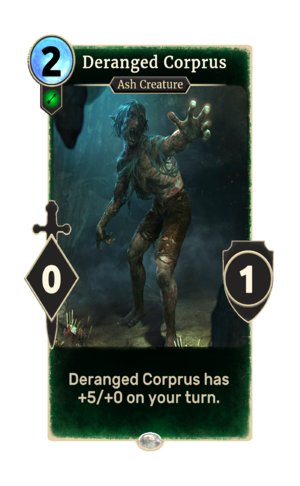 Deranged Corprus is a common Agility creature card. It is part of the Houses of Morrowind expansion. "[Pant]... They're all out to get me!" This card's ability applies the Unhinged card effect. This page was last modified on 2 March 2019, at 00:18.